Colorado Rockies’ Noel Cuevas is congratulated by teammates after the ninth inning of a baseball game against the San Francisco Giants Monday in Denver. The Rockies won on a pinch-hit single by Cuevas that brought in the tying and go-ahead runs. DENVER – A September call-up, Noel Cuevas just wants to make an impact. With one choked-up swing, he delivered in a most meaningful way – in the heat of a pennant race. The rookie pinch-hitter bounced a go-ahead, two-run single through the middle in the eighth inning and the Colorado Rockies rallied to beat the San Francisco Giants 9-8 on Monday after squandering a five-run lead. This was just another wild game at Coors Field as the Rockies remain in the thick of the National League West chase. They entered the day a half-game behind the Los Angeles Dodgers. 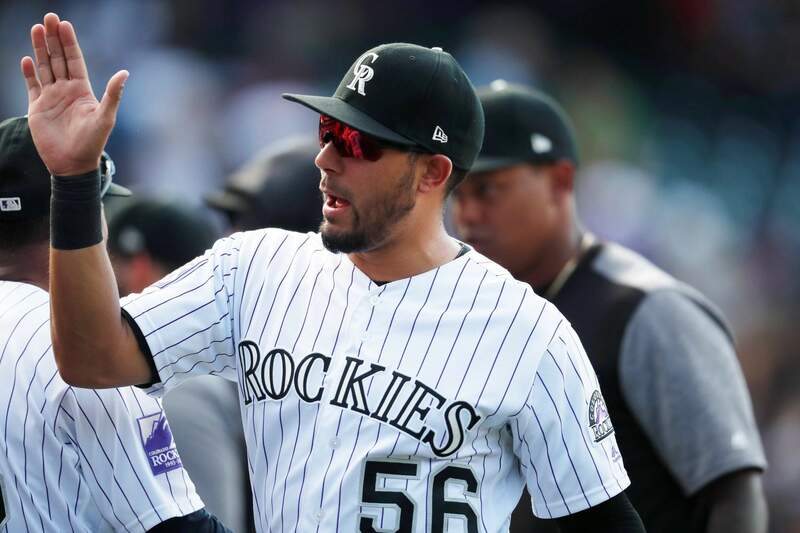 On an afternoon when Story hit two homers off Giants ace Madison Bumgarner and the Rockies seemed in command at 7-2 after five innings, they needed the rookie Cuevas to come through with that clutch hit. Ian Desmond started the eighth with a single and pinch-hitter Chris Iannetta later lined a double off the wall in right. Then, Cuevas stepped into the moment. He took a big first swing off reliever Tony Watson (4-6) and whiffed. So Cuevas decided to choke up on the bat and focus on going up the middle. It worked — a grounder through a drawn-in infield. It’s a pivotal stretch for Colorado, which started off 10 straight at home and all against NL West foes. Gorkys Hernandez homered for the Giants, who’ve dropped 15 of 17 in Denver since 2017. TRAINER’S ROOMGiants: OF Steven Duggar will undergo surgery on his left shoulder Tuesday. ... INF Brandon Belt wasn’t in the starting lineup due to right knee soreness. ROUGH OUTINGBumgarner gave up a season-high seven runs, six earned, over five innings. He surrendered three homers in a game for the seventh time in his career. PROGRESSRockies starter Tyler Anderson was in line for his first win since July 4 before the bullpen melted down. Still, this was progress. The left-hander hit an August slump in which he was 0-4 with an 11.39 ERA. Anderson had seven days off between starts and his command appeared back in rhythm as he allowed three runs and struck out seven over 5 1/3 innings. UP NEXTGiants rookie RHP Dereck Rodriguez (6-2) has a 2.47 ERA heading into his start Tuesday against Colorado. He’s also holding hitters to a .207 average. Rockies RHP German Marquez (11-9, 4.11) is coming off a start in which he had 13 strikeouts.